In situ data from two flight campaigns in California’s San Joaquin Valley, an area characterized by complex terrain and patchy sources, is used to estimate important aspects of air pollution meteorology including rates of: vertical mixing, photochemical production of ozone, and the surface emission of non-reactive gases. Shown is the utility of airborne studies to help constrain crucial elements of air pollution modeling including vertical mixing, horizontal advection, and emission inventories. The characteristics of three PM2.5 pollution episodes were analyzed during the APEC Summit at a rural site outside of Beijing. It was found that meteorological conditions on the ground could not explain the pollution process, while vertical parameters helped improve the understanding of heavy pollution processes. Our research suggests that regional transport of air pollutants contributes significantly to severe secondary particle pollution, even when local emission is controlled effectively. We find monthly, mid-latitude temperature changes above 40 km are related to ozone and temperature variations throughout the middle atmosphere. We develop an index to represent this atmospheric variability. In statistical analysis, the index can account for up to 60 % of variability in tropical temperature and ozone above 27 km. The uncertainties can be reduced by up to 35 % and 20 % in temperature and ozone, respectively. 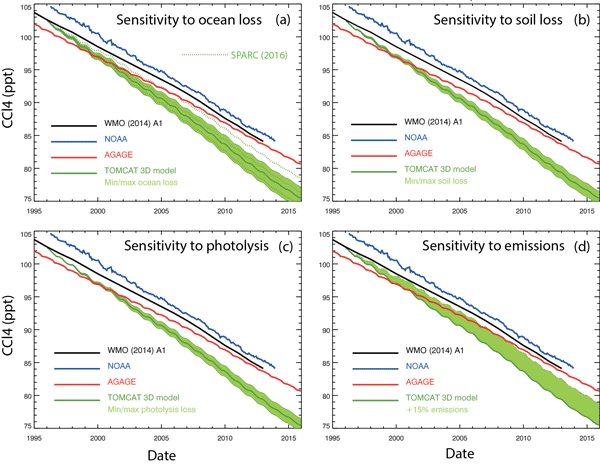 This index is an important tool to quantify current and future ozone recovery. In spite of the tremendous efforts, many questions remain unanswered regarding dust emission mechanisms. A series of wind tunnel experiments are carried out on dust emissions from different soil surfaces to better understand relevant mechanisms. Here are some interesting results that demonstrate the importance of surface renewal mechanism, which was normally neglected in previous research and is strongly recommended to be considered in future dust models. The Quasi-Biennial Oscillation is a wind oscillation in the equatorial stratosphere. Effects on climate have been found, which is relevant for seasonal forecasts. However, up to now only relatively short records were available, and even within these the climate imprints were intermittent. Here we analyze a 108-year long reconstruction as well as four 405-year long simulations. We confirm most of the claimed QBO effects on climate, but they are small, which explains apparently variable effects. For the first time in the UK, an Aerosol Chemical Speciation Monitor was used to measure aerosol concentrations in London in March–December 2013, with further organic aerosol (OA) source apportionment using the ME-2 factorization tool. Five OA sources were identified: biomass burning OA, hydrocarbon-like OA, cooking OA, semivolatile oxygenated OA and low-volatility oxygenated OA. This information can be used to take future action on the respective legislation in order to improve the air quality. Oleic acid is a chemical substance which is emitted from cooking processes and is present as tiny particles in the atmosphere. The oleic acid in the particles reacts chemically with atmospheric ozone, causing substantial changes to the composition of the particles. This paper uses new techniques to explore these chemical reactions and the effect of humidity upon them. The significance of the results for the atmosphere is considered. Electronic structure calculations are used to survey possible reactions that HOI and I2 could undergo at night in the lower troposphere, and hence reconcile measurements and models. The reactions NO3 + HOI and I2 + NO3 are included in two models to explore a new nocturnal iodine radical activation mechanism, leading to a reduction of nighttime HOI and I2. This chemistry can have a large impact on NO3 levels in the MBL, and hence upon the nocturnal oxidizing capacity of the marine atmosphere. The paper presents observations of clouds over the Antarctic Peninsula (a 2500 m high barrier separating the Weddell and Bellingshausen seas) during summer 2010 and 2011. The observations of ice and liquid particles in the clouds reveal that more particles were seen during 2011 and that this is associated with an air mass that has spent longer close to the sea ice surface. This suggests that sea ice is a source of cloud nuclei. We propose a new approach to estimate urban emission ratios that takes advantage of the enhanced local urban signal in the atmosphere at low wind speed. We apply it to estimate monthly ratios between CO2, CO and some VOCs from atmospheric measurement datasets acquired in the centre of Paris between 2010 and 2014. We find that this approach is little sensitive to the regional background level definition. With this new method, we may reveal spatial and seasonal variability in the ratios in Paris. Biogenic volatile organic compounds (BVOCs) – important in tropospheric ozone and secondary organic aerosol formation – were measured at a savannah grassland in South Africa. Results presented are the most extensive for this type of landscape. Compared to other parts of the world, monoterpene levels were similar, while very low isoprene levels led to significantly lower total BVOC levels. BVOC levels were an order of magnitude lower compared to anthropogenic VOC levels measured at Welgegund. Carbon tetrachloride (CCl4) is a compound which, when released into the atmosphere, can cause depletion of the stratospheric ozone layer. Its emissions are controlled under the Montreal Protocol, and its atmospheric abundance is slowly decreasing. However, this decrease is not as fast as expected based on estimates of its emissions and its atmospheric lifetime. We have used an atmospheric model to look at the uncertainties in the CCl4 lifetime and to examine the impact on its atmospheric decay. With a mechanistic model for the middle and upper atmosphere we performed sensitivity simulations to study a possible impact of a localized GW breaking hotspot in the eastern Asia–northern Pacific region and also the possible influence of the spatial distribution of gravity wave activity on the middle atmospheric circulation and transport. We show implications for polar vortex stability, in situ PW generation and longitudinal variability and strength of the Brewer–Dobson circulation. Po Valley (northern Italy, 42 000 km2, 15 million inhabitants) is a real-scale model to test whether environmental policies may improve one of the worst air qualities in Europe. In this study we show how pollution from fine and coarse atmospheric particles (PM2.5 and PM10–2.5), largely originating from anthropogenic emissions, dropped thanks to the broader use of cleaner and more efficient technologies. Solar geoengineering has been proposed as a possible additional approach for managing risks of climate change, by reflecting some sunlight back to space. To project climate effects resulting from future choices regarding both greenhouse gas emissions and solar geoengineering, it is useful to have a computationally efficient "emulator" that approximates the behavior of more complex climate models. We present such an emulator here, and validate the underlying assumption of linearity. Severe high ozone episodes usually have close relations to synoptic systems. A regional continuous ozone pollution episode is detected over the Yangtze River Delta region in August 2013. By means of observational analysis and model simulations, it is found that the western Pacific subtropical high and Typhoon Utor play an important role.